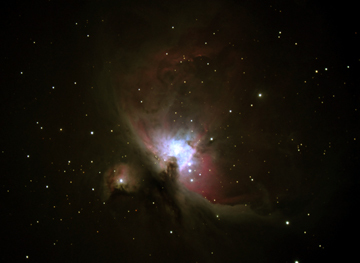 On November 12th, 2009, I bought a new Celestron CGEM 9.25" and finally had a chance to first light it January 8, 2010. It was frigid and windy so I only spent about an hour setting up, working on the fine collimation and then taking it all back down. The cold was too much. I'll resume January 9th where I left off and hopefully will see the perfect airy disk. The weather has been rather poor for quite some time and I was also down with a back problem for the last half of December and was unable to really lift the mount to heft it outside. I was able to use the mount in mid-November, but was using my C-8 NGT to take digital SLR shots after getting a Bahtinov Mask which helps with fine focusing. The CGEM mount seems to work light years better than the the CG-5 mount that came with the old C-8 NGT. Although the CGEM mount has Programmable Periodic Error Correction, the periodic error is fairly small when using the 8" f/5 NGT and a Nikon D90 with corrector, at prime focus. I can say I am very pleased. I've obtained a Bahtinov Mask and an F 6.3 reducer corrector for the 9.25 which I'll install tonight after achieving a that perfect airy disk and possibly image the Orion Nebula as a first shot test! I hope the cold doesn't kill me. Celestron CGEM 9.25" F/10 SCT January 9, 2010 - It is cold as crap! Install and align finder scope; I used the Orion Nebula to find the Trapezium and then aligned the finder. The finder is cheesy, a small 6x30 finder with plastic screws (give me metal so I can lock it down). Well intended but really inadequate for my needs. For such a nice scope, why would Celestron skimp on the finder? Tried to obtain an airy disk at 352x using Betelguese. Turbulence prevented ability to really be sure the airy disk was perfect. That will have to wait for a more stable night, as tube currents probably contributed to the turbulence. I then realigned the finderand was done by 7:30 pm, made hot chocalate, moved to next step! Started shooting 15 second exposures of the Orion Nebula at 8:06 pm... and after a bit, I realized I left the damn mask in place which I sheepishly removed and resumed imaging. Overall, I like the telescope and it does have a nice flat field across a Nikon D90 chip. There is vignetting due to the F 6.3 reducer corrector and I do not know the true focal ratio. To yield the correct .63 reduction, I have read that the CCD needs to be ~ 85mm from the focal reducer and I've also read and used a calculator that dictates 105mm. I'll have to check this further and was running at 95mm. The mount is excellent! Small periodic error without using PPEC. Once it warms up in the spring, I'll experiment with PPEC.